The Listener Feedback has POURED in these past couple weeks, and the Gomers are lovin it. 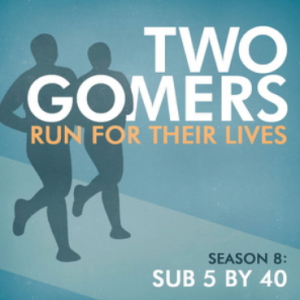 Join them as they discuss running, with a tangent here and there: sports bras and running skirts, bamboo socks and sticks covered with lube, Eagle Scout near-misses and zombie-killing dogs. Our excuse is that since this is a Listerner-Feedback-centric show, it’s you, the Gomernation, who sent us on these tangents. Doesn’t that make you feel good about yourselves? Happy Running! Ok, guys, you are making me hungry! Please stop talking about the luscious burgers…I have been trying to lose the last ten pounds for ten months…my marathon is in 5 weeks…and I eat more during your podcast than I used to during Biggest Loser! Well she has a new podcast and as soon as she said I thought of you guys! Great minisode, I have to go with pizza too. Hey, I notice that boc hop was gone from the minisode again. Gomers, I think I can offer some insite on the “be water” montra…could it be that its supposed to be “be fluid”? anyway…I will be chanting “be water” now thanks to you! keep it up!